Wouldn’t you love to be greeted home with a batch of these? 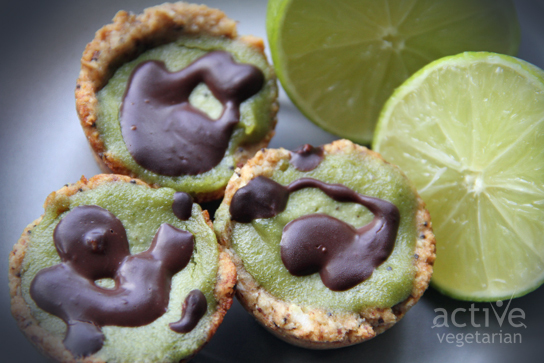 We’re talking mini cheesecakes and not just any ordinary kinda cheesecake! 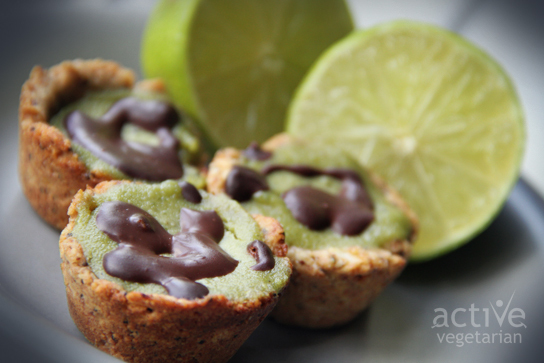 Typical cheesecakes won’t make you feel as good as these vegan version will! Natural sugars, a lot less fat and nutrient rich ingredients just add to their charm! To make the crust, combine all the ingredients in a food processor and process until finely chopped and starting to hold together. Press the mixture into mini cupcake pan sprayed with non-stick spray. Alternatively you can use a torte pan. For the filling, combine avocado, cashews, lime juice and zest, maple syrup, sea salt, and vanilla in a food processor and process until smooth. With the motor running, slowly add the coconut oil and process for a minute. Preheat oven to 350F. Bake for 35-40 minutes until lightly golden along edge and it springs back slowly when touched. I baked them for 40 minutes, but baking time may vary. Place pan on cooling rack for 10 minutes, carefully remove. Let cool completely. Once cool decorate the cupcakes with melted dark chocolate.